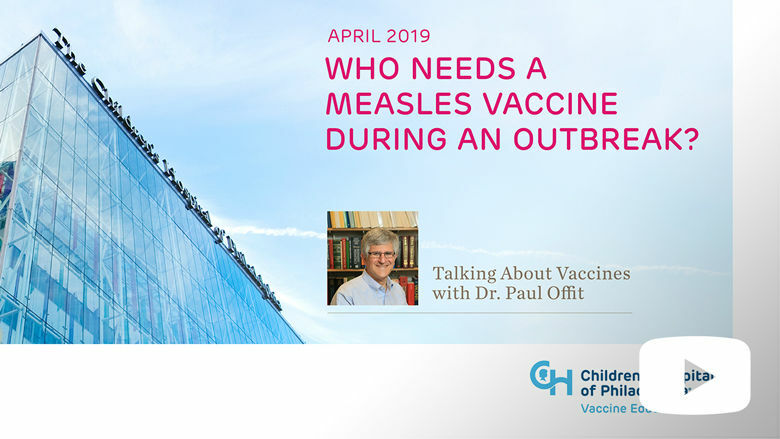 In this video, Dr. Offit explains who may need measles vaccines during an outbreak. The accompanying article includes what you need to know about measles disease, the vaccine that helps to prevent it, and considerations for both vaccinated and unvaccinated individuals during an outbreak. Recommendations can vary for different vaccines. This can cause confusion for parents making vaccine decisions. In this short video, Dr. Offit describes different types of vaccine recommendations using the meningococcal B vaccine as a key example. After a three-year hiatus, the intranasal flu vaccine is once again recommended for use during the 2018-2019 influenza season. 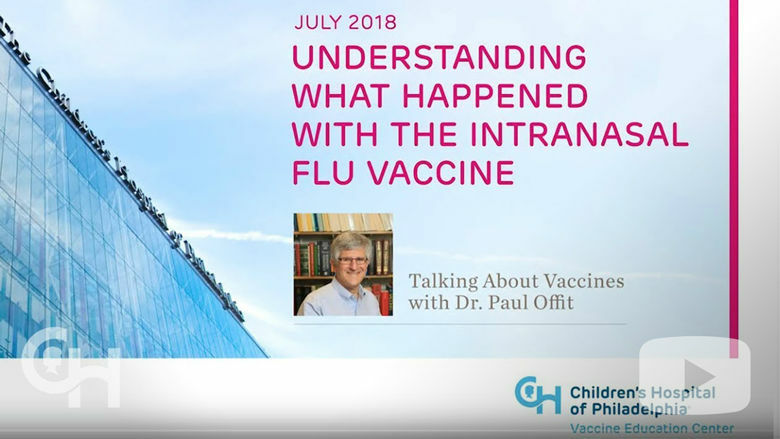 In these videos, Dr. Offit explains the changes to the intranasal flu vaccine and the recommendations regarding its use by the CDC and AAP. A new hepatitis B vaccine is now available for adults. The vaccine requires only two doses, as opposed to three of other versions, and has the potential to increase adult hepatitis B vaccine rates. 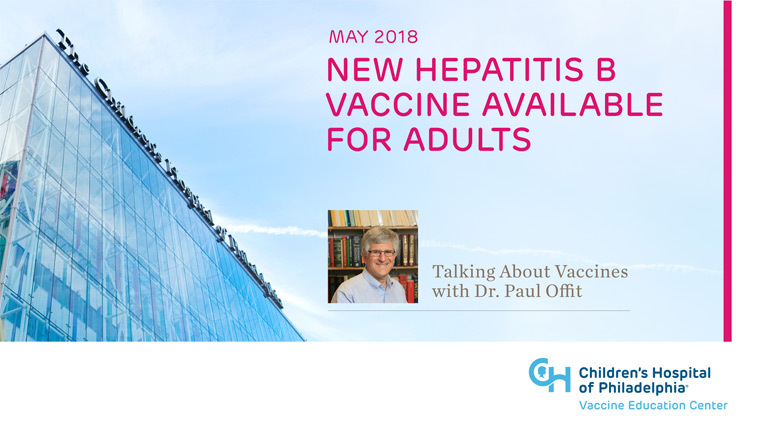 In this short video, Dr. Offit explains the origins and benefits of this new hepatitis B vaccine. 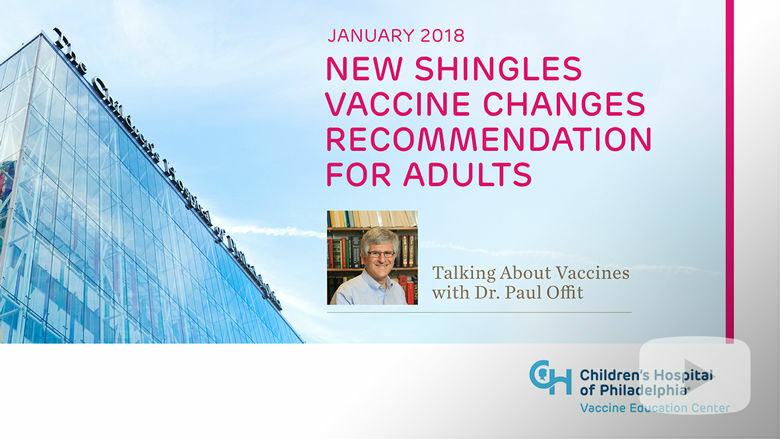 Paul A. Offit, MD, discusses the benefits of a new shingles vaccine, called Shingrix®, as well as how it differs from the existing shingles vaccine. 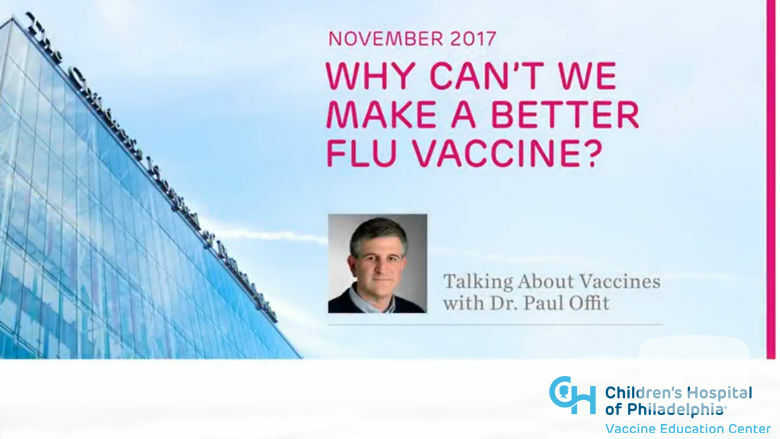 Dr. Offit Address the Question "Why Can’t We Make a Better Flu Vaccine?" Influenza is the only vaccine-preventable disease that requires vaccination each year. 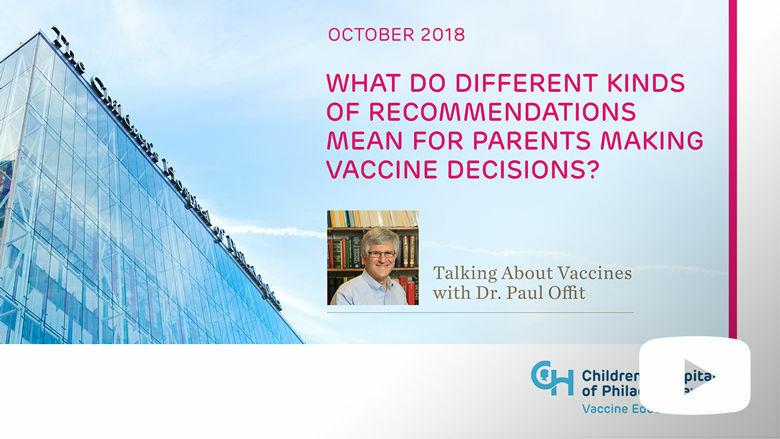 Dr. Paul Offit, Director of the Vaccine Education Center, discusses the scientific challenges to making a better vaccine. Despite the proven safety and effectiveness of HPV vaccine, the vaccine remains underutilized. One reason is because of misinformation about the vaccine’s safety and chronic diseases. 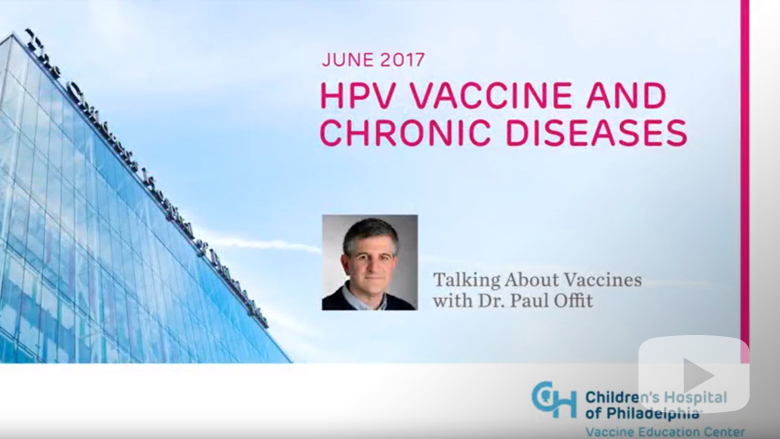 In this short video, Dr. Offit discusses these concerns. While mumps is no longer common in the United States, outbreaks still occur. 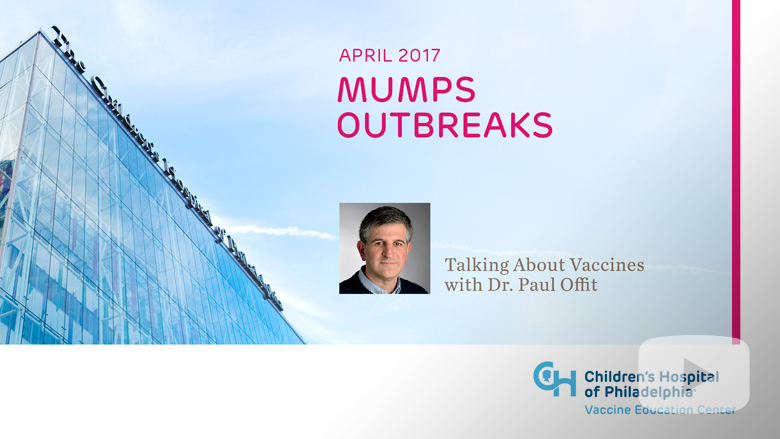 Dr. Offit discusses the recent mumps outbreaks and what they teach us about the mumps vaccine. Many parents are unaware there are two vaccines to protect their teens against meningococcal disease. Read more about meningococcal vaccines and watch a video of Dr. Offit, VEC director, discussing the meningococcal B vaccine, the newer meningococcal vaccine. The ACIP recently recommended that the nasal spray version of the influenza vaccine not be used during the 2016-2017 influenza season. Read more about the reason for this decision and what effects it may have, and watch a video of Dr. Offit, VEC director, discussing the ACIP’s decision.